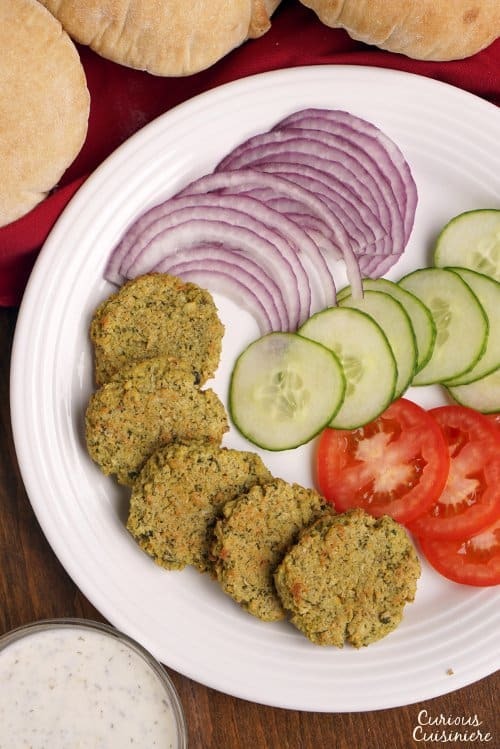 Baked Falafel gives you all the healthy, nutty falafel goodness without the hassle or added fat of frying, and it’s just as good for stuffing into a pita! If you’ve ever bitten into a crisp and nutty, falafel-laden pita, rounded out with veggies and topped with a creamy sauce, then you probably know that there is just something about falafel that makes them SO crave-worthy. For a long time, we would seek out falafel from street vendors whenever we got a craving. Since we’re not huge fans of deep-frying at home, we thought that falafel would be difficult and tedious to make. But, now that we’ve conquered the recipe, we’re doing a serious happy dance, because we have a secret. We can have falafel whenever the craving strikes. With only a little forethought, and a little, SIMPLE prep-work, our falafel cravings can be met! 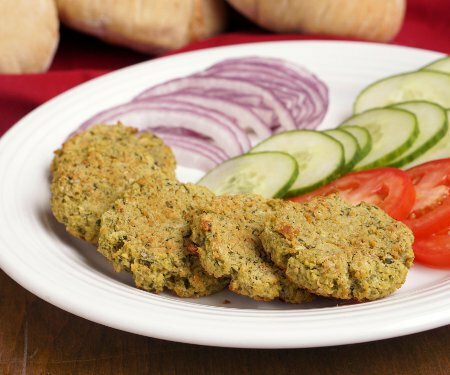 Falafel is a Middle Eastern appetizer made of a bean paste that has been deep-fried. 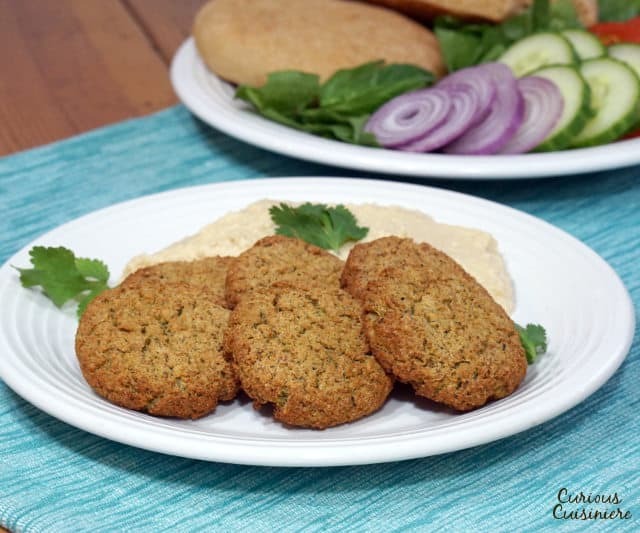 Traditionally falafel was made from fava beans, and in Egypt it is still made that way today. Other places in the Middle Eastern world now make their falafel out of chickpeas (or a combination of chickpeas and fava beans). 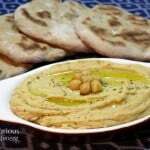 This chickpea version is the one that has become widely popular in the Western world over the past few years. 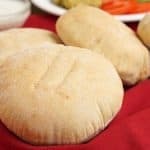 In the Middle East, these patties are traditionally served with hummus and tahini. Sure, it might not look too pretty, but your falafel dough should be fluffy and want to stick together. It is important to make sure you grind it until it reaches this point! 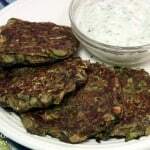 There are two types of recipes you will find if you browse for a falafel recipe. 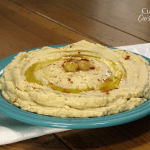 The most common uses canned chickpeas, but the more traditional method uses dried chickpeas. 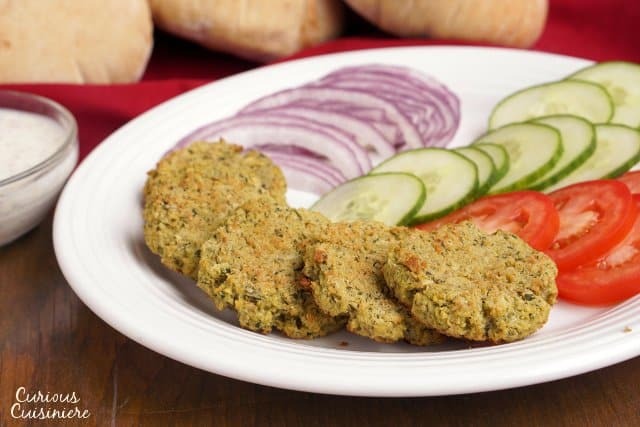 Cooking beans releases their starch, and starch is what traditionally acts as a binder for falafel. 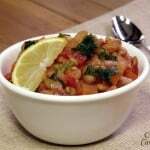 If you use canned chickpeas, which have already been cooked, the starch has already been released. Because of this, you have to mess around with other binding agents to get your falafel patties to stick together. 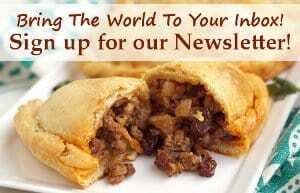 Most commonly, these recipes use flour and baking soda to bind the beans together, some recipes will even use eggs. When going with this version, you will find yourself doing a very delicate dance with the binding agents. Will the patties stick together or not? You might not know until you drop the falafel into the hot oil. Let’s just say, there’s a reason that these patties are traditionally made with ground, uncooked beans. 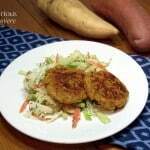 Using uncooked beans means that the starches are released as the patty cooks, holding it together and giving it that wonderfully fluffy texture. You don’t want to be grinding dry chickpeas though. (Take our word on that one.) The beans need to be soaked in water for 12-16 hours. When soaked, the chickpeas will absorb water, doubling or tripling in size and softening considerably. They soften so much that, after soaking, it is possible to grind these uncooked beans into a thick paste. If you grind them fine enough, they only need a little heat to become soft and tender falafel patties. Traditional falafel are deep fried, giving them a moist interior and a golden, crisp exterior. But, if you want to avoid the mess of the deep fryer (and the extra calories that the oil adds) baking them is a great alternative. Baked falafel won’t get quite as crisp and golden as the deep-fried version, but they are still just as tasty. To help our falafel get some of that golden color we brush them with olive oil before baking. 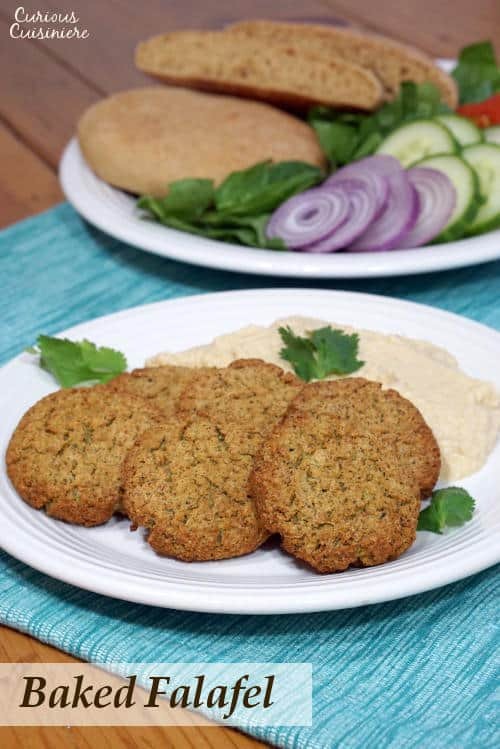 We have included instructions for baking and frying in the falafel recipe below. Try them both and see which you like best! 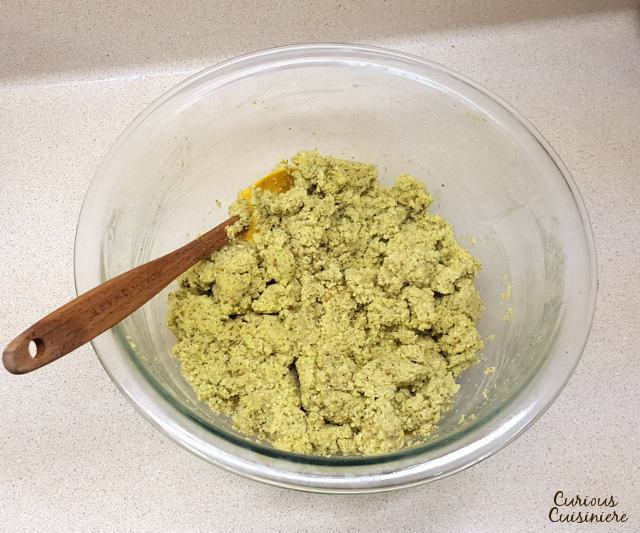 Leftover falafel dough can be stored in a sealed container in the freezer for up to 1-2 months. Thaw it completely before cooking. Or, shaped falafels can be frozen on a sheet pan. Once solid, they can be transferred into an air-tight container and stored in the freezer for 1-2 months. Thaw the patties completely before cooking them the same as you would if they were fresh. The chickpeas for this recipe will need to be soaked for 24 hours before making the falafel. Place the chickpeas in a large container and cover with 4 inches of water. Let them soak for 24 hours. Shape the dough into balls, using roughly 2 Tbsp of mixture each. Press each ball into a 1/2 inch thick patty. 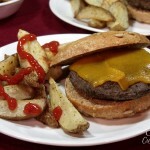 Place the shaped patties on a greased baking sheet and let rest for 15-30 minutes. Place the shaped falafel on a well greased baking sheet. Brush the tops of the falafel patties with olive oil. Gently drop the shaped falafel patties into the hot oil. Fry for 2-3 minutes on the first side. Turn the falafel in the pan and fry for an additional 1-2 minutes on the second side. 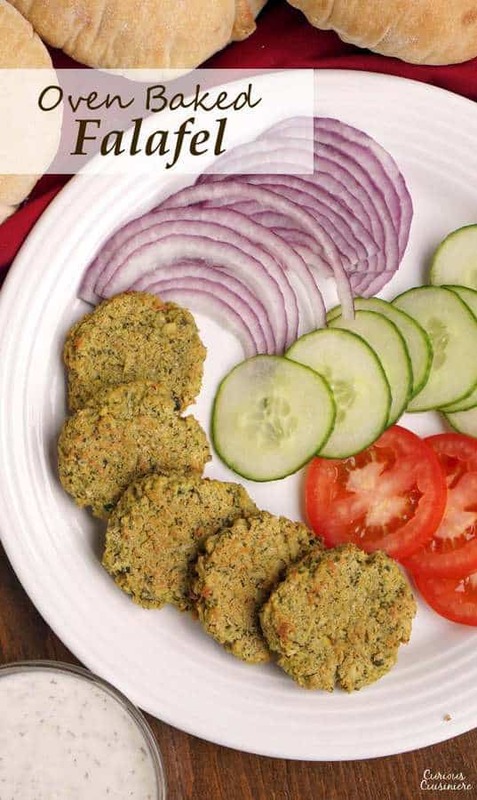 Serve the falafel with hummus and vegetables or make a sandwich with pita bread and your favorite toppings. 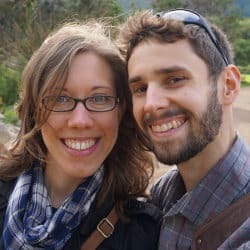 This recipe from April 2016 was updated May 2017. We made the falafel even more tasty! Enjoy! 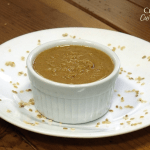 We’ve updated our pictures since we first shared this recipe, but we’ve left the original images here as a fun throwback. Enjoy!